Home » Jacob and Us » Jacob’s Development – A Test of the Down Syndrome Treatments Plus Other Things to Consider. Jacob’s Development – A Test of the Down Syndrome Treatments Plus Other Things to Consider. 1…A Developmental History: Proof of the Treatments for Down Syndrome? 2…To The Future and Beyond. The Possible Importance of Keeping the Condition Down Syndrome Alive. 3…Our conclusions about the Down Syndrome Treatments – How it all fits together. A Down Syndrome Developmental Case History: Proof of the Therapies Treatments for Down Syndrome? Jacob started out being a good sucker and took well to the breast, but with all the stress that hit at the time, feeding deteriorated – it took several months to regain full breast feeding again. By two months of age he seemed to be turning into a blob on the floor and we realised he needed more of everything. At age three months he said “mummy”. With the stimulation from the Day Care Centre and from us, the piracetam and so on, we think he started to pick up. Around 7 or 9 months of age he was noticably moving ahead – starting to catch up with those of his own age group. By 14 months he was sitting and rolling and had been doing so for quite a while. Jacob at 15 months went through a bit of a “I’m brighter” spurt. All of a sudden he was crawling, pointing, pointing at pictures in books and wanting them named, following simple verbal directions such as “place your hands on your head” and loves verbalising in pretend conversations with people and toys. He pushes doors open then pushes them shut once he has passed through. Understands “No”, but doesn’t like it. Jacob also plays at a kitchen draw and has, for some time, been able to reason of his own accord, that if something drops where he can’t reach, that he can then use another kitchen tool to extend his reach and knock it to where he can get it. One last thing, he absolutely loves watching the goldfish in our large aquarium – he’ll sit there kneeling by himself, just enjoying them swimming around for 15 minutes or so at a time. The physio and OT, whom we hadn’t seen in about 3 months, well we saw them on Wednesday and they said he had developed really well without them and although he was still behind, they thought he was progressing so well on his own that he didn’t need to see them for about another month or so. However, they still diagnosed low muscle tone in spite of him being on the tone formula. Jacob is now progressing from just kneeling, to standing at the aquarium to watch the fish – he wanted to look at the fish through the side of the aquarium, so had to stand up and crane his head around. He has also progressed from the aquarium and stands up at other furniture as well. The visit with his peadiatrician on Tuesday was still basically pessimistic, but if Jacob continues developing like he is, I think he will then see past the Down Syndrome. At the moment he sees Jacob’s head circumference as being typically Down Syndrome, well below normal head circumference, the same for height and weight. This a very hard waiting time. Not knowing whether the Down Syndrome retardation has been beaten or not. We believe it has, but the uncertainty is there. To top it all off, I used an adaptive behaviour scale to score Jacob’s development. He scored with an adaptive behaviour quotient of 101 – average for his age! NO delays! One point better than the average baby of similar age. If he keeps developing like he has this past month, he’ll be right up there with his brothers and sister in no time, quotient wise. Minor update of the update 17.96 months: With just two days to go to the 18 month mark, Jacob is now climbing up stairs and walking around furniture. Minor update – 17.98 months: With one day to go, Jacob is now undoing zippers and can almost pull himself right off the floor while hanging onto the dining room table, his tippy toes just remaining on the floor. He can open doors by turning the handle – provided he isn’t standing in the way of the door opening. Jacob also picked up a book and demanded it be read to him. At 18 months exactly, Jacob is now opening drawers and cupboards. Nothing is safe from his curiousity. He is standing of his own accord for a few brief seconds without any suppport and whereas before he would refuse to stand when you’d try and encourage him to, now you go to put him down and his feet go to the standing position. For some weeks now (4 to 8 weeks) he has loved playing roll the ball to someone and have that someone roll it back to him. At around 18.5months Jacob was pointing at things and saying “look”. We also believe he has said “look mum” on two occassions. He also waves goodbye and says “bye bye” at the same time. So close to walking this and last month. Has tried to walk without support, but not yet suceeded; however, if I tell him I want to see him walk and support him under the arms, he moves his feet and legs appropriately. We are hoping he will be walking before 20 months. He picked up a whistle and blew it after seeing his brother do it in the bath. Uses a toy telephone appropriately – picks up the receiver, talks into it, then puts it back down. Jacob also responds to verbal encouragement in an understanding way, as opposed to just us reinforcing his behaviour by imitating him: If I say to him, it’s good to hear you talking and I want to hear you talk, he will then vocalise alot more. The fact that he appears to be learning through just seeing and responds to requests appropriately, suggests his intellectual functioning is doing rather well. Sometimes we feel he is doing better than our other kids did in some ways, but it is hard to remember precisely with everything that has happened over the last few years. The Down Syndrome features seem to have diminished in the past few months and it is hard to see the Down Syndrome in him. Occassionally he will do a certain facial expression and the DS stands out like a sore thumb; but we don’t think you could pick him as having Down Syndrome if you didn’t know. A few months back an experienced older doctor looked at him and wasn’t sure if he had DS or not and that was way back then. We feel his development has slowed down of late. He seems to be building up strength in his legs in preparation for walking unaided by furniture. His drawing was assessed by the OT as being about four months advanced for his age. He is using more words, but they are difficult to understand. We were able to stop the tone formula for the time being – not sure whether that is because the TNI is having a stronger effect as time goes on or whether the muscle tone formula isn’t working as well on him now. One thing that I have noticed about others who relate to him, is that some put his developmental slow areas down to Down Syndrome, which I have to admit I do as well, and some put his advanced areas down to the training / stimulation he is receiving. I don’t feel it’s fair, it’s like Jacob isn’t being given credence for things he does accomplish – stimulation or not – he is the one learning, he is the one who is self motivated, and he is the one mastering his environment and absorbing from it and, that shows intelligence. I correct people – including professionals – who don’t understand this. “My ball”. His ball floated over his brother in the bath. He reached across and got it saying “My ball”. The speech therapist has found he has fluid in the ears and apparently it’s like listening to someone talk when you have your head stuck under water. His ears were fine at the last check, a year back, when we thought he may have had fluid, so we were surprised. Jacob is climbing up things like lounges and loves the indoor slide, where he gets to climb up onto a platform, look round and make noises to us and then slide down – his cackle is absolutely wonderful. In himself, he seems to be developing quite normally since we upped the piracetam dose to the new recommendation of 75mg per kg of body weight. The physio., in particuliar, noticed that Jacob was more focused and attentive – and freely commented so without being questioned, prompted or told about the piracetam increase! I also note that The Down’s Syndrome Research Foundation of the United Kingdom is now giving parents and doctors of the United Kingdom the information they need to order the Piracetam and they note that they are having many enquiries about piracetam for people with DS. Jacob may be putting 3 or 4 word sentences together. He now says “I love you” and “bath time” and climbs into his chair when he wants to be fed. He is still quite deaf, but there are days when his ears drain and he can hear very well we think – the DS worker said that kids with Down Syndrome should have their ears checked for fluid after every upper respitory infection; it can only be checked by the machine, not by looking. He seems to understand things said to him at an age appropriate level. He can take up to 36 steps now and spends much of his time standing and walking. He can also run for several steps. He loves others copying his behaviours and will copy other people as well with, for example, hands on head. He knocks on doors when he wants to get through to the other side and, on passing through the door, he closes it behind him. He puts balls into tight fitting holes then knocks them through. He has also shown he can undress himself with little assistance – his arms get caught in the long sleeves. He says “ta” when handing you something and you take it from him. He has also pretended to feed his brother after his brother pretended to feed him. After seeing his mum push the walk button on the pedestrian crossing, he tried and got it right after one correction. One good thing about updating this page each month, is that we get to see how Jacob has advanced, even though we sometimes feel nothing much has improved. Keeping a diary of their kid’s development may be encouraging for new parents of kids with Down Syndrome. Jacob saw the paediatrician and he put him at a level roughly six months behind his age cohorts. Best IQ estimate is now 75; up about 20 points on previous estimate about seven months back! The physiotherapist reckons he has advanced more in the last six weeks than in any other six week time interval since he was born! Her comment was freely given with no prompting from me. He is interacting much more obviously, initiating games, such as copy me and chasings. He purposely involves himself with others, by, for example, sitting in the middle of what you are doing, particularly if you are building him a cubbyhouse out of large plastic blocks…. Well, he has been busy. Imaginative play has become clearly identifiable – for example, he picked up a toy gun, aimed it and made a shooting sound in play with those around him – laughed appropriately when his victims pretended to be hit. In the sandpit, he’ll shovel the sand in the bucket. He’ll go up to other kids and sit with them when he wants – but apparently has a tendency to spend too much time on his own, so an aid worker may be going to be assigned to help integrate him with the others a bit better. Jacob is following directions more obviously, such as “take my hand and I’ll take you to the bath” and “sit here if you want me to feed you”. He’ll walk outside and say “hello ducks” to the ducks. Dances to music and tries to sing. Has said “finished” when eaten his fill of food. Will tap us to get our attention if we don’t notice him when he wants to be noticed. Said “bab lounge out” and when Carolyn said she couldn’t take him to the lounge, he took hold of her night gown and led her through the door, down the hall and into the lounge room. He can nod his head for yes and shake his head for no, when asked a question. Puts his sister’s dolls into strollers and tries buckling them in. Loves to kick and throw balls. Works out problems of day to day living, such as he’ll climb through a ride in toy cars window to push his sister out when he can’t get in through the door and he notices that if he puts too much weight on the side of something it will start tipping, he’ll then stop, and try another approach, such as by struddling a ride on car to sit on it, rather than climbing on it from one side. Our Down Syndrome Worker visited, couldn’t recall Jacob well enough to comment on how he has progressed between visits, but did say, that although he was still in the Down Syndrome range of abilities, he was obviously in the higher functioning group. So, it was good to hear the higher functioning bit, but disappointing he was functioning in the Down Syndrome range still. Jacob continues to develop, but it is hard identifying exactly where; he’s getting better at doing the things he’s already doing. His language is still behind, but his interactions leaves me feeling good about his development. He plays games and readily learns new ones and makes them up just as fast. Jacob is quite expressive without being very language orientated. Jacob continues to use new words, such as “wait”, “see ya”, “ball there”, “brother”, “read”, “fork” and “water”. The frequency with which he uses words is extremely low unfortuanately. Which makes a speech delay appear very evident – his Down Syndrome worker commented though, that his language is likely down because everyone is doing everything for him and he therefore doesn’t have a need to ask for things etc. Jacob’s ability to learn new things quickly is impressive, his OT and Physio both commented on this without any suggestion from me. One of the things Carolyn (his mum) has picked up on, has been his response to the microwave beeping – he has learned that that is when the microwave is opened up and he tries to do so. He has also been found to be iron deficient again, so is now on iron supplements again. Well, Jacob in a few days will be three years old. His speech is much more frequent and he engages in long conversations – difficult to understand as he misses some sounds from his words – the audiologist said he had good enough hearing to support language acquisition, so it will be a matter of time and training. His play is more age appropriate in that he plays, for example, with toy cars much more purposefully. Still behind though in the more complex interactive play, though he will readily interact in a playful way with others – for example, he will grab a glove or a soft topy and chase you while growling; loves getting on the trampoline (he doesn’t have the life threatening neck problem that some people with Down’s Syndrome have) and bouncing around with me or one of his siblings. He is just starting to bounce himself. Likes to climb on ones back and get bounced a round in a backing broncho type of game on the trampoline. Enjoys dancing to music/singing; sings himself. It’s at this developmental time that I really enjoy being a parent, because they give so much joy back – you can loose onself in the play with them as you become a pirate or a jedi knight tackling them and being slain by them – and they can communicate back to you so much more clearly; babies are fine, but this age is golden. IQ wise, I would still place him around the 75 mark. There are times when I think it is lower and other times when I think it is higher. Jacob’s language is progressing well enough. Some of his new clearly spokenutterances includes “play”, “stop”, “no”, “chips”, “ugly”, “get out, “I don’t know”, “let me out”, “get outa here”, “you dumb boy”, “cut it out” (meaning stop it), “open the door”, “Don’t do that”, “Yeah, I did”, “I can’t keep up”, “Who is it?” and “What?”. The “You dumb boy” one caught us off guard and we are not sure if someone has called him this or whether he worked the insult out. He does engage in very long purposeful discussion at times, but we don’t understand what he is saying. Jacob seems very advanced with his speech in comparison to other kids with Down Syndrome. Spoken vocabulary around six times greater than the average kid with Down Syndrome of same age; by asking questions Jacob demonstrates the use of grammar, normally unheard of in his age cohorts with Down Syndrome. 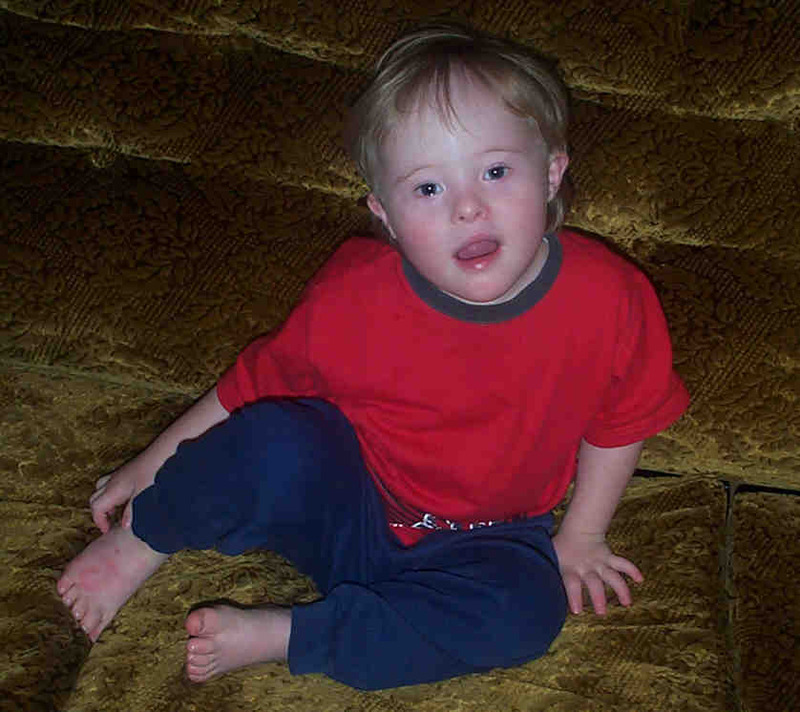 As speech is one of the most delayed symptoms of Down Syndrome, Jacob is doing a ‘WOW’; this also suggests that his developmental progress is around 71% of normal; developmental quotient around 71+. At my request, the Occupational Therapist conducted a test of Jacob’s fine motor abilities. The range was from 15 months up to 29 months. Overall average 20 months, suggesting an developmental quotient of around 55. She commented that he presented poorly on some tasks, even though she knew he could do better at them – for example, she knows he can cut paper with scissors, but in the testing situation, he appeared to be totally unaware of how to use the scissors. 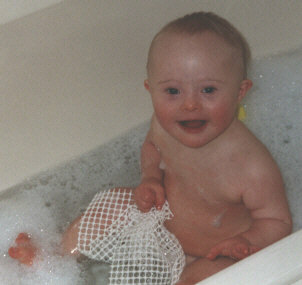 She will be comparing Jacob to the Down Syndrome test norms (my request), as well as to the standard norming population. He had a bad runny nose on the testing day, so his hearing and perseverence may not have been good. She had some concern about his understanding of verbal directions as well. This 20 month result has stunned us all. We will know better when some Down Syndrome norms are made available – it appears there may not be such norms. He was bitten on the face at day care and started biting at home again – but this seems under control. He learns quickly. He has really taken to pen, pencils, texta’s and paper. Jacob quite happily will sit on his own drawing for 45 minutes or so; on some days he has spent nearly the whole day and night just drawing. We allow Jacob to draw on our coffee table with textas – being a much larger surface which can be easily wiped clean has proved an advantage for him I think. His Occupational Therapist commented on very marked progress in his teachability and self control, as well as in his drawing and use of colour when she saw him last week. She thought someone must have been teaching or showing him writing as some of his lines looked like he was trying to write words. His walking gait is still not correct, his physiotherapist assessed him at my request and found that he was having trouble with his balance – the gait was from him keeping his legs further apart to avoid falling over – so he now goes to a group to practice his sense of balance and learn to jump and so on. Jacob will do naughty things intentionally to get attention, has done so on and off for quite a while now. So when he heads for the document cupboard we know he wants us to notice him. Things were going rather slowly. He was progressing with speech and so on, but it was slow. Then I had a prophetic dream which foretold a rapid development, particularly in speech. In a matter of days his speech had increased dramatically in frequency. Now it is more likely he will speak than not speak. Ask questions, answer questions, follow directions more readily and quite well. He will pick up new phrases, off the TV for example, then change the phrase to suit his situation – not just imitating, but adapting and understanding. Toilet training seemed like it would be going to take for ever. It was like magic. He started taking his pants off, sitting on the potty and doing his wee. He is now doing this several times a day. Having the potty in the room with him and using disposable pull up nappies seemed to help, as well as having a toilet training cartoon that he choses to watch sometimes, but, in the end, it is Jacob that is showing us what he can do. Then there’s his jumping, seemed like it was never going to click in, then it started, took a few weeks, now he can jump when he wants. When the toy library loaned us some interconnecting road and wall blocks, he just sat down and put them together. Not only that but he sorted by the colour he wanted to use and by the shape he wanted to use. No promptings! Before this he would normally just fondle them and leave them. Although Jacob has a generally slow development, he seems to go into hyper development and astounds us all. It’s been an incredible month. Jacob is one clever chappy. We completed another adaptive behaviour scales test on Jacob. Whereas about two years ago he was totally age appropriate, this time his adaptive behaviours had fallen into the mild range of developmental disability. At this point it is fairly obvious that the interventions we have so far employed have failed to prevent the developmental disability from developing. As our doctor has pointed out, we don’t know what he would have been like if the interventions hadn’t been employed; perhaps he would have been much worse off, perhaps not. The regular blood tests have presumably helped us to prevent a much greater drop off by bringing to light deficiences that required urgent intervention. BUT, 44 months is not the final verdict, that sort of happens at 60 months; until he reaches 60 months his abilities could go in any direction – so it is still a wait and see until then. One word of caution: The tests I use are psychological ones and are therefore quite accurate, but if I were to go to a popular website one on developmental growth and use it to determine Jacob’s progress, then he appears to be age appropriate. So just be a little cautious about using online guides. We have worked out his entry into the school system: One year of kindergarten and then about two years in reception, before starting year 1 – all in the normal school system. We have started some basic signing with Jacob, as we have been told that this can help them to speak more at his age. The paediatric specialist in disability that we saw a few days back, could not explain Jacob being able to speak perfectly new words then losing the words into just a mumble jumble of sounds within minutes – though he obviously knows and understands how to use the words. Much of the language Jacob has long term use of shows the typical Down Syndrome pronounciation. He has such a large vocabulary. We know the Day Care experience is partly working against him, as he stopped speaking there for months and his toilet training and speaking went way backward at home when he resumed there after a two week absence just recently. However, the benefits, we think, still outweigh the negatives. In about sixteen weeks he goes up into an older group of kids and the toileting will be more appropriate and consistent with what we are now doing – so we wait. Now that he has started speaking there again, perhaps the skill will continue there as well. I found out when I took Jacob to see a neurologist in Dec., 2003, (Jacob aged 3years, 11months) that Jacob has auditory short term memory difficulties; he forgets how to say the word before he has mastered saying it. It is a form of dispraxia. We now need to work around this – it wasn’t that the genetic opportunity with language was lost, though that is still a possibility, but appears to be more a short term memory problem with remembering how to express new words. If we had known this at the start, our entire strategy for his language development would have been very, very different. The importance of repetition would have been emphasised a lot, lot more. Take note with your own kids – there are many who have kids with Down Syndrome who don’t have the short term auditory memory problem, so they can say this or that strategy worked for them and that you should use their strategy, but it wont necessarily work for yours. We now know that although James MacDonald’s strategy appears to be a good one, that Jacob needed alot more repetition and so on. As I learn more about how to work around Jacob’s auditory short term memory problem, I will post the information on his learning to walk and talk page. The big identifier with Jacob was when he said “wake up Geoff” perfectly clearly, but by the time his fourth or so repitition had happened in rapid order, the words had become incomprehensible. That was only a few months back. It was the key that told us to look further than speech therapists, Down Syndrome workers and so on. Luckily our doctor took it seriously enough to refer Jacob to a neurologist and the neurologist listened when I said it was more than just environmental factors. Jacob appears to understand the difference between one and two. Just today he was asked to put all the spoons back except for one and he did so. His use of sentences has been somewhat limited of late and I was relieved to hear him say a three word sentence. He continues to pick up new words. We have reduced his piracetam and nutrient supplements right back, with no ill effect being noted in his behaviour nor in his blood tests; if anything his overall health has been getting better. My personal feeling is that the nutrient intervention and piracetam were important in the first three years of life. After this time, Jacob seemed to be stronger in himself, less sick with his immune system improved with age and a pretty good work out care of day care. We keep him on a low dosage of piracetam and nutrients now, too help keep him in peak performance. Blood tests are still vitally important we believe. Jacob has started kindergarten pre-entry this month. He seems to amaze them with his self confidence, explorative behaviour and understanding of words and sentences. He seems to be well liked by some kids and his teachers. One kid asked me does Jacob talk, I could only reply “sometimes”. His language is the greatest hurdle he now has for his social development. He continues to pick up new words, but he is still finding it very difficult. Some of his new words include “In there.” while pointing to another room where he left his trousers (was in response to being asked where his trousers were). He is doing stand up wees at the toilet a fair bit now and he is sometimes taking himself to the toilet when he needs to go. He has also used the toilet/potty for two or three poos. He is readily joining in activities at Day care. Getting up and dancing with the other kids, being in front of them doing actions to songs… At home and at day care it is noted that he is playing much more age appropriately, packs up after himself and really wants to be playing with other people – not be on his own. When he is on his own the Occupational therapist noted that his self play etc was much more age appropriate as well. All in all, it has been a very good period of development. We have introduced vinpocetine. It’s not easy to tell the effects it’s had on Jacob because he has been developing well – he is one 10mg daily, which we crush up and put in his food. It is tasteless and odorless. I chewed one for some time just to see. He is now cutting with scissors, is practically toilet trained in the Day Care Centre and is slowly showing signs of toilet training in the home and other places. Has picked up some more different words such as saying “me too” when Hannah was getting an ice block. Answers yes/no questions reasonably often now and is trying to communicate much more. He has developed a friendship with another kid and they spend much time playing together – they love sword fighting. Jacob plays with his toys much more appropriately and is showing good understanding in social interactions. In terms of the vinpocetine, I have noticed marked improvement in my eyesight and in the reduction of the tinninitis (ringing/buzzing in my ears). It also seemed to improve my general confidence in doing things – I suppose because my senses can relay information to my brain more clearly. I believe I may be seeing this general confidence boost in Jacob as well, which may suggest he is able to better interact with the world around. I will put a webpage on vinpocetine together in the next few weeks and try to see how it is effecting Jacob more clearly. “The Urquhartites, an old forgotten political party of the industrial revolution era of France, has once again come to the fore. It is now being lead once more, by an Australian this time, specifically, Jacob Urquhart. Born with Down Syndrome (DS), he achieved fame as being amongst the first Down Syndrome kids in Australia to defeat the retardation that was once so typical of this syndrome. However, the Down Syndrome temperament of highly sociable, outgoing and loving, which are the trademarks of Down Syndrome, have placed him in good stead. It is no wonder that parents are now aborting kids who are unfortunate not to have Down’s Syndrome; instead opting for fertilisation programs that guarantee higher Down Syndrome probability. We wish him well in his climb to political fame and trust that his pleasant personality type will herald in a more caring political order. If you are interested in the development of kids with Down Syndrome and would like some ideas from a dedicated mum of what you can do to speed it up, checking out Jacob’s link page will reveal a link to John Marr. It is up to you and possibly your doctor to look into it all and decide what you will use and what you wont. This is how I see everything fitting together (May,2004): An analogy is a truck with an undersized engine, it can coast downhill, putter along the straights, but then noticably struggles with any resistance (wind, hill, rain). The only good solution is a bigger engine capacity, increasing the fuel strength (Targeted Nutrient Intervention, fish oils…) can help the engine a long a little, tuneups (blood tests) can help prevent minor and major breakdowns of the engine and other parts. Eventually though, it’s the engine capacity (IQ) that heavily governs the trucks speed and there’s a whole bunch of scientists who believe and are working on, finding ways to increase the intelligence of our kids with Down Syndrome. I don’t believe there is currently anything that can increase the intelligence of our kids yet, not by much anyway, the exception perhaps being the down syndrome kid with a sluggish personality, which may respond favorably to smart drug intervention. However, in the not too distant future, I think that there will be interventions that may benefit all kids with and adults with Down Syndrome. The main goal until then is to keep our kids as safe as we can and, in spite of it’s difficulty, preserve the intelligence they currently have – so that they will gain the most advantage when the newer drugs eventually come to be.